Join the more than 6 million people who choose Bradley International each year for our convenience, ease of access, and hassle-free travel experience. 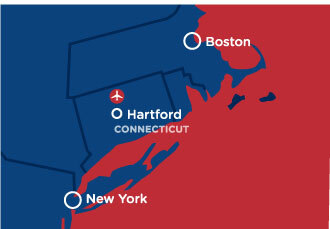 Conveniently located between Boston and New York, Bradley International is perfectly situated for your trip to the Northeast. Everything you need for your journey is accessible right from Bradley International Airport. Known for its friendly and personal approach, Bradley International offers a calm, welcoming environment as a base for all your exploration. Enjoy a range of shopping and dining options right at the airport, including some of our region’s favorites. Choose from 30+ nonstop destinations to the country’s most popular cities. And, with less lines, less traffic, and great walkability, you and your group can love the journey! PLAN & BOOK YOUR TRIP TODAY! Planning a trip? Let us help! The team at Bradley International is here to ensure your journey is the best it can be! Contact Alisa Sisic at +1-860-292-2023 or email asisic@ctairports.org. For help with planning tours of the region, please go to www.ctvisit.com or www.mass.gov/orgs/office-of-travel-and-tourism.